It’s been two months. Two months of chaotic thinking, anxiety, grief, darkness. Two months since I said goodbye. Two months since grief has been an everyday process. Two months of learning how to live without a father and grandfather. Two months of battles. Two months of hugs. Two months of waking up randomly and crying. Two months of talking and trusting and relying. Two long months. 2015 was the hardest year of my life. The last 2 months wrapped it up in one giant word. GRIEF. there was so much grieving in the last year. And to be completely honest it is continuing. Losing two people has been enough but even before all of this there was grieving that I didn’t know what to do with from my own lack of trust in God and seeing others close to me go through hard times. The death of my dad and grandpa were just the cherry on top. This last week God has challenged me to start looking at grief through His eyes. In this season I am learning how to not see God as a being who has a stiff arm and soured look on His face when I come into His presence. He’s taught me that He is embracing me in this season. In the grief of realizing the unbelief I’ve cuddled up next to through out my life. In the grief of losing relationships, saying goodbye to passions and communities, and holding my grandpas hand as he took his last breath. He is embracing me. One of my favorite stories in scripture is found in Matthew chapter 14. When people say that God knows how we feel they truly mean it. Jesus walked this earth and had a real life human experience. He experienced loss and pain. He experienced grief. But this part of His life shows me more than just His grief but it also reminds me of God’s Grace. Jesus just found out that His cousin died. Not only was this a part of His earthly family but John was the one that prepared the way for Jesus. Out of everyone Jesus was around John the baptize understood what Jesus was going through to some degree. He too had been looked down upon and was responsible with a very high calling. I’m sure when Jesus heard that John had died, it hit him in the core of his body. Though the Bible doesn’t give us details of Jesus’ pain it does say that He tried to get by Himself but was met by a crowd of needy people. Many times in life I’ve tried to deal with a sudden set of emotions while dealing with others. This summer I said goodbye to a part of my life that I loved. Within hours of saying goodbye to an amazing set of people I was woken up with news that my grandpa had fallen. With a head full of questions I had to push through the crowd of circumstances that now encompassed me. Chaos. I’m sure Jesus felt chaotic. there were so many things out of control yet He was able to address the needs of the crowds around Him. How? Grace. Jesus stayed focused on the Father and He knew that if the Father was calling Him to heal the crowds that His Father would provide rest. Though this last year was full of grief I have to say it was fuller of God’s grace. I don’t deserve to have a faithful God. A God who believes in me when I don’t believe Him. A God that’s so gentle and patient when I want to hold on to old ways of thinking. I don’t deserve His peace of mind or strength but that’s the grace of God. I don’t deserve it and can’t arrive so that I do. He freely gives His grace to those who love Him and for that I am forever grateful. I don’t know where you are in your journey as you read this but I pray that if you need to experience God’s grace that your eyes would be open to it. And if things are brighter for you today I pray that you would rely on God to help you extend grace to those around you. 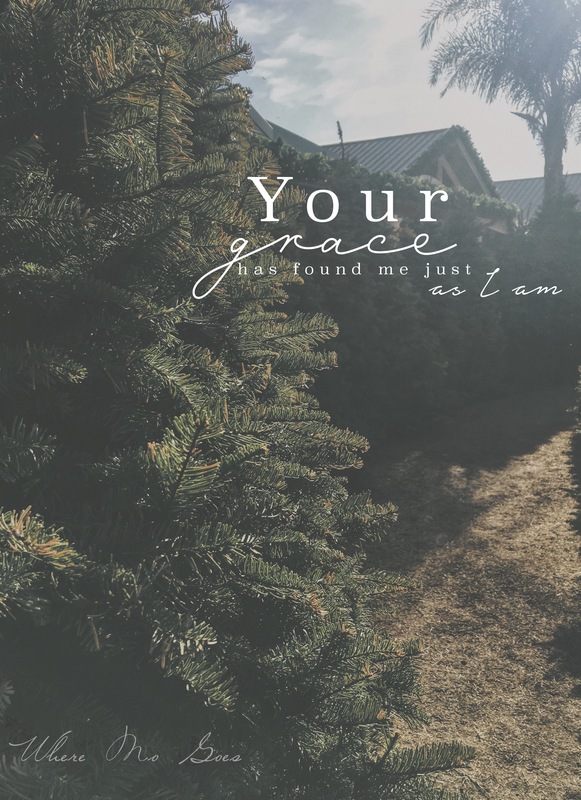 I pray that no matter what 2016 holds we would reach the end and see God’s graceful hand guiding us along the way and our steps becoming more secure on His path because His grace has found us just as we are.